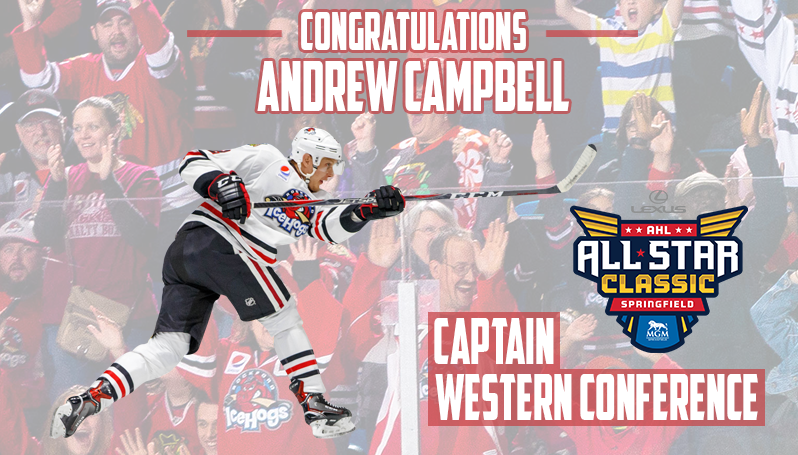 ROCKFORD, Ill. – The Rockford IceHogs, in conjunction with the American Hockey League, today announced that defenseman Andrew Campbell has been named the Western Conference’s playing captain for the 2019 Lexus AHL All-Star Classic presented by MGM Springfield. Campbell is Rockford’s first player to serve as captain at the All-Star Classic, and the All-Star selection is the first of Campbell’s AHL career. Campbell, 30, has skated in 24 games with the IceHogs this season while serving as one of the team’s alternate captains. The blueliner has tallied 19 shots on goal and 14 penalty minutes during the campaign, and he scored his first goal with the Hogs on Oct. 28 vs. Manitoba. The veteran blueliner is currently on pace this season to become just the 74th player in the AHL’s 82-year history to skate in 700 career AHL games. He enters Thursday having skated in 679 AHL games during his 11-year professional career between Manchester, Portland, Toronto, Tucson and Rockford. He has served as captain or alternate captain for each of those five teams during his career, including wearing the “C” with Manchester (2013-14), Toronto (2015-17) and Tucson (2017-18). Overall, Campbell has logged a combined 142 points (34g, 108a) through his 679 career games in the AHL. In addition, the Caledonia, Ontario native has helped his team reach the postseason in eight of his 11 seasons in the American League, totaling 13 points (3g, 10a) and a +8 plus/minus rating through his 64 career Calder Cup playoff contests. As of Thursday, Dec. 20, Campbell ranks 29th among AHL defensemen and 81st among all AHL skaters in all-time games played in league history. He is also currently tied for ninth all-time among AHL defensemen with a career plus/minus rating of +90. Campbell was originally selected by the Los Angeles Kings in the third round (74th overall) of the 2008 NHL Draft. He was acquired by the Blackhawks last offseason from the Arizona Coyotes. Captains for the American Hockey League All-Star teams are selected by the league president each year in recognition of their outstanding leadership and service. Campbell will join the Eastern Conference captain, Lehigh Valley Phantoms forward Colin McDonald, and the complete All-Star rosters in Springfield, Massachusetts for the annual showcase. This year’s Skills Competition will be held on Sunday, Jan. 27, and the All-Star Challenge is scheduled for Monday, Jan. 28 at the MassMutual Center. For additional information, visit springfieldthunderbirds.com/allstar.